SCVHistory.com LW2825 | Newhall Incident | Hostage's Son Talks to Reporters, 4-6-1970. April 6, 1970 — Jeffrey Hoag, the 17-year-old son of hostage Steven Hoag, talks to reporters while his father is still being held inside his own home by cop killer Jack Twinning (pronounced TWINE-ing). The Hoag house was located on the hill above the gas station at the southwest corner of The Old Road and Pico Canyon Road, as seen here. At the time it was considered the "top of Lyons." 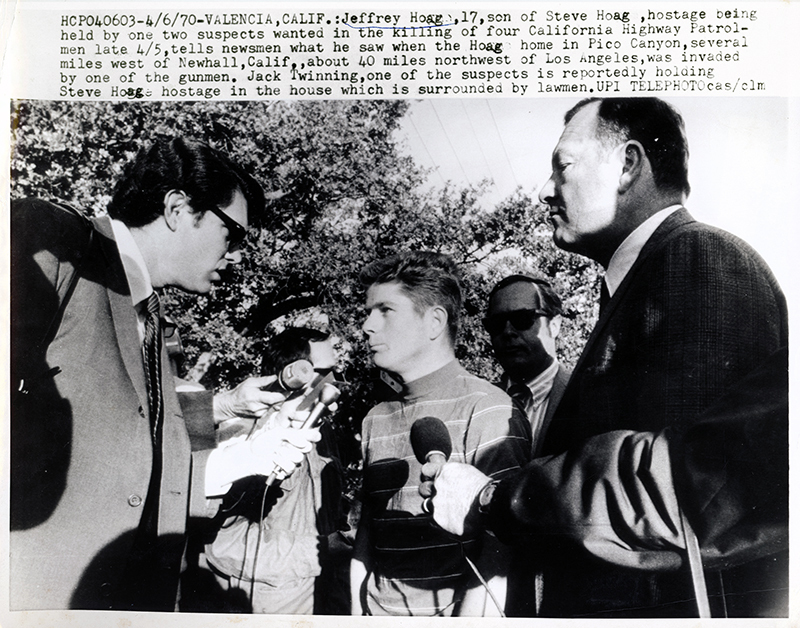 4/6/70 — Valencia, Calif.: Jeffrey Hoag, 17, son of Steve Hoag, hostage being held by two suspects wanted in the killing of four California Highway Patrolmen late 4/5, tells newsmen what he saw when the Hoag home in Pico Canyon, several miles west of Newhall, Calif., about 40 miles northwest of Los Angeles, was invaded by one of the gunmen. Jack Twinning, one of the suspects, is reportedly holding Steve Hoag hostage in the house which is surrounded by lawmen. UPI Telephoto. Note: Although the Hoag home was a couple of miles south of where the Newhall Incident occurred, the Hoag home wasn't "several miles west of Newhall." Nor was it in Valencia, despite the dateline. It was actually in Newhall. Today it would be considered Stevenson Ranch, where the first tract housing opened in 1988. LW2825: 9600 dpi jpeg from original photograph purchased 2015 by Leon Worden.